And the beautiful beach at the end of the road, that was full of people kite surfing when we arrived, although obviously not when this photo was taken! Again, we had several lists of restaurant recommendations for our time in Cadiz, which we stuck to pretty religiously as although I'd visited a few times from Seville when living there, I had forgotten most of Cadiz, and had never really found the best places to eat there the first times round anyway. As you know my blog is about recommending places I've enjoyed eating at, and not really about ripping holes in those I haven't enjoyed, BUT.... I have to warn you off a certain place we ate at in Cadiz, because it was the most expensive and worst meal we had all holiday. It was our first evening in Cadiz and we had been given a list of 3 places to eat by a Spanish friend of a friend who is apparently a real foodie. So I don't know if it was a bad day for this place, or if the guy who said we should go there hasn't been for a while, but it was truly awful! The tiniest amount of salmon, hidden underneath badly chopped salad and palm heart straight from a tin, all of which was drowning underneath a sickly tomato ketchup/mayo that tasted like it was from a cheap bottle. Next up was prawns and clams with garlic. How wrong could they go with this?! Really wrong! It looks pleasant enough, but the clams hadn't been cleaned, so each mouthful of seafood had a big bite of grit in it. It was so nasty we barely ate any of it, it really was like they'd seasoned it with sand. And there were barely enough clams in it to have produced that volume of grit. Finally, we had solomillo al whisky, again similar to what we'd had in Seville. This was meant to be tenderised pork fillet, cooked in whisky to make a liquid sauce, and served with potatoes. What we got was a chewy piece of meat on top of a gelatinous substance that tasted neither of pork nor whisky. We picked the ham off the top and ate that, and struggled to eat more than a mouthful of what remained. With a bottle of wine, our bill came to over 90 euros!! This didn't include service, and the guy serving us looked about as happy as if he'd just come from a funeral - anything we asked for seemed to be such an effort for him. We paid up, left, and went and had a strong drink to try and forget what had just happened! But luckily a new day brought a new dawn, and on day 2 we found one of the best places to eat in Cadiz. 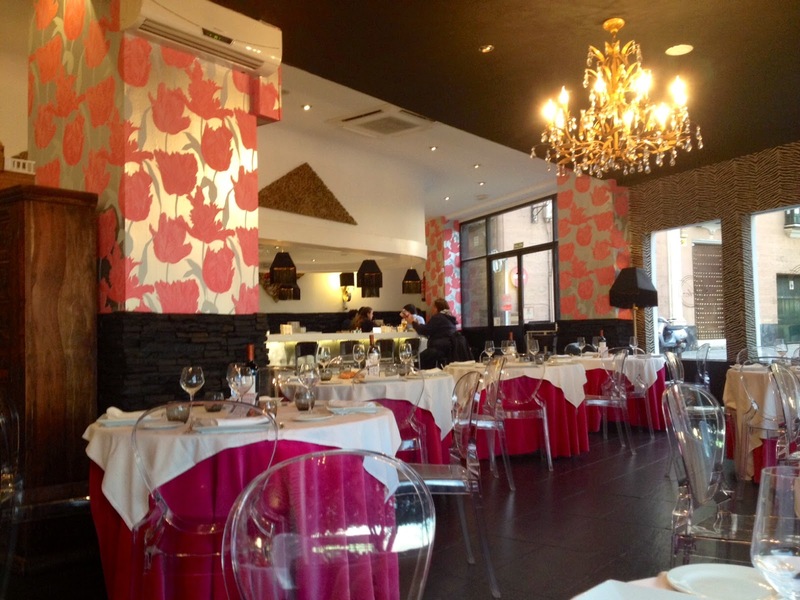 Just 2 minutes away from the flat was Casa Manteca, on Calle San Felix. It's a small bar, serving pork in all its glorious forms, by weight, on pieces of greaseproof paper, and couldn't have been more different from our disastrous night before. Everything was delicious, each with its own unique flavour. Don't expect too many vegetables though - we finished our meat heavy meal with a plate of local tomatoes, that were exceptional - juicy, red and delicious, but also the only vegetable on the menu! In sharp contrast to El Balandro, our bill here was around 15 euros for lunch for 2! It's really busy in Casa Manteca and I don't believe they take bookings, but grab a beer and wait in the sun for a seat, I promise it'll be worth it! We spent the afternoon wandering round the old town of Seville. We went up one of the towers that have views across the whole town and out to sea, and spent time on the beach, watching cats, that were watching fishermen and waiting for them to catch something! In the evening we walked into the centre of the old town and sat down for a very strange cocktail... we asked for mojitos and were given glasses full of a brown liquid - I think he'd omitted any sort of mint, and had used tons of brown sugar, hence the colour. Slightly miffed we wandered on to the town square and found Freidura las Flores which specialises in all things fish. Like Casa Manteca, the menu was simple and great value. We ate prawns, squid and potato salad, all of which we good. The star of the show there though was the octopus - so soft it was like butter and perfectly seasoned with paprika, salt and oil, I could've eaten plates full of it! And if fact, I had eaten half a plate of it before I remembered to take a photo.. The next morning we grabbed a coffee and fresh orange juice from a cafe outside the flat, packed our stuff once again, and jumped in the car to head to the Finca Cortesin for the weekend, more of which to come in my next post. Cadiz is a really pretty town, and if you're in Andalucia it is definitely worth a visit. There are lovely walks around the town, lots of water sports to watch (or take part in) and apart from the horror of the first night, the food really is very good there. Just stick to where the locals eat and you'll be fine! Thanks Danny! Yup, the prawns were horrid, but lessons learnt! Never going there again!! Oh dear, what a disappointment that restaurant was. You expect more of places with a reputation like that and there's never any excuse for bad service! (unless he had just come from a funeral...!). The place looks beautiful. I long to live somewhere with palm tree lined roads.